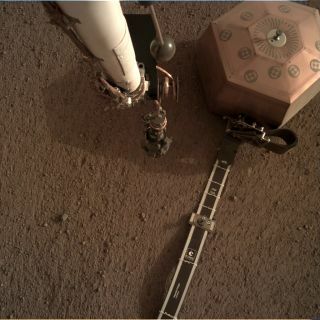 NASA's Jet Propulsion Laboratory manages the InSight lander that arrived at Mars in November. The team deployed its seismometer earlier this month, as shown in this image captured Jan. 11, 2019. SAN FRANCISCO — NASA's Jet Propulsion Laboratory has not furloughed employees due to the ongoing government shutdown but "may have to consider some adjustments on a mission-by-mission basis" if Congress does not approve NASA funding by the end of January, Veronica McGregor, JPL spokeswoman, said in an emailed response to questions. Because of its varied funding sources, JPL is in a better position to weather the current political storm than NASA's owned and operated field centers. Most of the space agency's civil service workforce already has been furloughed. On Tuesday, Caltech President Thomas Rosenbaum addressed the government shutdown in a message to the Caltech community. "As the partial government shutdown enters a record fourth week, Caltech operations continue apace, but future negative consequences remain a possibility," Rosenbaum said. "The most significant impact is on JPL. Prior to the shutdown, laboratory management worked with NASA to maximize the available funding for JPL's tasks. To date, JPL has been able to avoid furloughs, but may have to adjust staffing levels if the shutdown continues into February." Caltech operates JPL under a $15 billion five-year NASA contract that began Oct. 1, 2018. Caltech and JPL spokespeople declined to specify how long the current funding would last. JPL contractors told SpaceNews Caltech has enough funding to run JPL for most of February. During 2013 government shutdown, JPL's work was not interrupted because Caltech had government funding to continue work for four to five weeks and the shutdown ended after 16 days, said Casey Dreier, Planetary Society senior space policy advisor. The current shutdown became the longest in U.S. history on Jan. 12, breaking the 21-day record set when the government closed from Dec. 16, 1995 to Jan. 6, 1996. If this shutdown continues long enough to deplete funding for JPL operations, Caltech leaders will have to decide whether to keep the doors open­, according to a JPL contractor who asked not to be identified. "Generally, the expectation is that as the work continues the funding will show up eventually," said Paul Little, Pasadena Chamber of Commerce president and chief executive. "That's what has happened in the past." In its 2017 annual report, NASA's Jet Propulsion Laboratory published this chart showing its annual budget and spending on major programs. For now, most work at JPL continues without interruption. "We can continue to do our jobs as long as they don't require interaction with NASA civil servants," said a NASA contractor. However, "any new task plan or new decision is stalled," said a JPL employee. Eventually all the decisions awaiting approval from NASA headquarters will pile up, Dreier said. "They can only go so far without headquarters signing off on certain things," he added. As the shutdown drags on with no sign of near-term resolution, JPL employees are beginning to worry about its possible impact on planetary missions. "The window for Mars 2020 is not going to wait," said the JPL employee. If Caltech lays off a significant number of JPL employees, it would have to inform California's Employment Development Department. Under the Worker Adjustment and Retraining Notification Act, Caltech would have to file a notice 60 days prior to closing a facility or laying off 50 employees or more.